I ran my numbers earlier today to update my weekly shadow reporting page. I expected the figures to be bad (they are), and this week I contributed to making them worse. 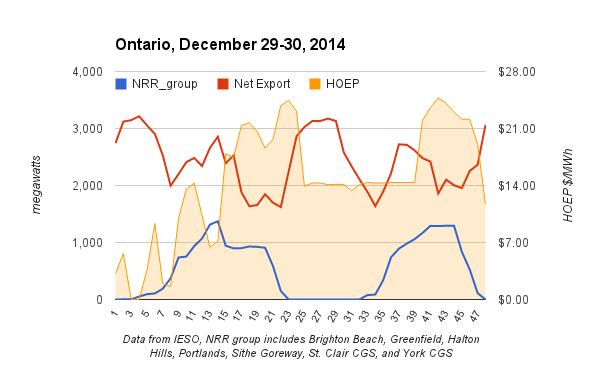 On average, each hour of the past week Ontario was exporting 2,827 megawatts more than it was importing. That's a record for any week since the alleged market opened in 2002. The weighted average Hourly Ontario Energy Price (HOEP) was $5.66/megawatt-hour (MWh), which is slightly over half a cent a kilowatt-hour and slightly under the charge Ontario's consumers pay to allegedly pay down an allegedly stranded debt. The HOEP is calculated only on Ontario Demand. Weighting the hourly price to net exports indicates an average rate under $4/MWh over the just past week. The best price an Ontario electricity hostage rates is $77/MWh (7.7 cents/kWh). So the most optimistic presentation on the pricing of exports is that every hour Ontario's supply was sold outside the province for $206,000 less than captives of Ontario's regulated price plans paid for the same quantity of product. One of the year's disappointments for me was the Ontario Energy Board's Market Surveillance Panel's rebuttal of statements from Parker Gallant. I can only assume the resolute imbecile willing to continue to numbers such as those from last week actually indicate a profit of $4/MWh on exports is first up for the next needless, yet lucrative, position. Ontario's system operator reports weeks from Wednesday to Tuesday - so I'm writing about the 7 days from December 24th to December 30th. 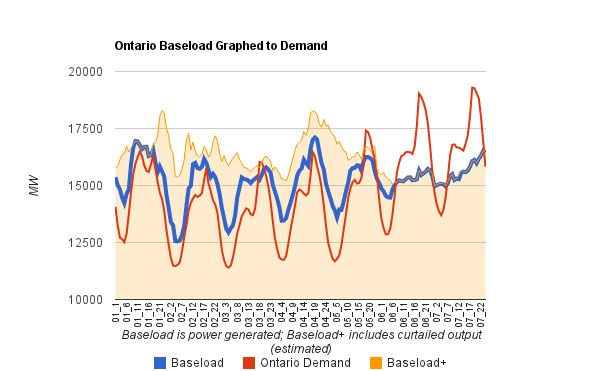 The graphic shown here includes a "Baseload+" area that shows my estimates of supply Ontario committed to paying for, whether it was generated or curtailed. Through Sunday prices were low because the province had too much supply. Blame those 5 days on 7 years of political interference in the procurement of almost universally unnecessary supply, and the type of bureaucrat recently exemplified by the OEB's market surveillance panellists. Monday and Tuesday - the week's final days - interested me because of the combination of supply from natural gas generators, and the HOEP. Even at $3/MMBtu this looks like most natural gas-fired generation from the contracted fleet of generators Ontario's ratepayers are required to pay net revenue requirements (NRR) to were bid into the market below the cost of fuel - fuel purchased from outside of the province to generate power within the province to send out of the province apparently below the cost of the fuel to produce it. That's the work of Ontario's IESO, and for 2015 the IESO super-sizes as the Ontario Power Authority is abolished. Since I started blogging in 2010, I've often encountered examples of public service and professionalism at the OPA and I hope the people there find some post-OPA success with an employer that does allow them to do the work they are paid to do without idiotic lobbyist driven interference. One of the most interesting pieces of economic models I encountered while working on the blog was that the long-term price elasticity of demand, for electricity, is much greater than the short-term price elasticity of demand. That means that as the price rises, not much happens in the short term, but over a longer period (5+ years). Last week, I became an example of how this works. While some Ontarians may have been reeling from the Auditor General's excellent work on smart meter foolishness, I was getting a not-smart meter on my home. The IESO week of Dec. 24- Dec. 30 is the first full IESO week since that not-smart meter was turned on, along with the natural gas furnace and gas stove that required its installation. 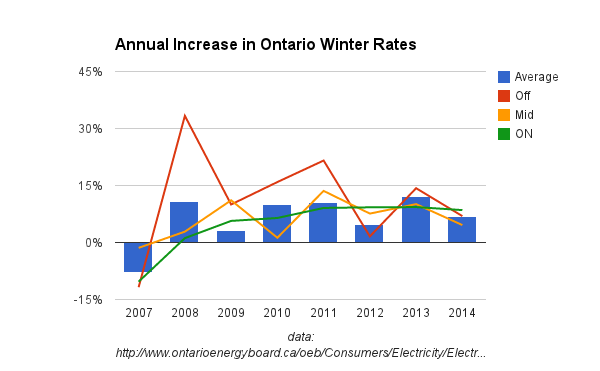 During Ontario's record export week I was consuming far less electricity as I used little for heating and cooking. That's not a short-term consequence of the past 7 years, during which the annual commodity price increase averaged 8.6%. 7 years ago I was looking at ground-source geothermal heating (and cooling) and working on ways to shift demand to off-peak hours. Now I'm not - and nobody who own this home ever will.